Evelyn Sample-Oates, is often described as a bridge builder, a motivator, a mover and shaker, a person of resource, the consummate advocate for the voiceless and ambassador for the hopeless. She is one of the “Go-To” people in Philadelphia to get the job done according to the Philadelphia Tribune newspaper. She is a Lifetime member, Silver Star (25 years), Charter member and was initiated into Alpha Kappa Alpha Sorority, Inc. in 1984 as a freshman in college. 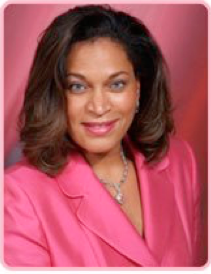 In 2006, Evelyn was elected to serve on the International Board of Directors for Alpha Kappa Alpha Sorority, Inc. as the North Atlantic Regional Director, the founding region of the sorority. During her tenure as the Centennial Regional Director for the Notable North Atlantic Region, she developed the Ethel Hedgeman Lyle Leadership Academy with 642 members graduating, she completed the Centennial history book of the region, implemented Love Your Sister Day, started The 4.0 Club for undergraduates, and established The Day of H.O.P.E. ; where thousands of members completed service throughout the eleven states in the region, all on the same day to Help Other People Excel. During her first year as a Regional Director, she raised $100,000 for the Educational Advancement Foundation and endowed the Evelyn Sample-Oates H.O.P.E. Scholarship. To date, more than 15 scholarships were awarded under this category. Under her leadership, the North Atlantic Region experienced the largest growth in its history, reaching a record breaking 9,773 active members in the region and co-hosted the largest conference in the history of the organization with over 25,000 members registered in the birthplace of our sisterhood during the Centennial Boule in Washington, DC. In July 2010, Evelyn was appointed to serve as the International Regional Director by the 28th International President, Attorney Carolyn House Stewart. She grew the region to its largest active membership in the history of the region. In March 2012, she chartered the first undergraduate chapter in the Bahamas on the island of Nassau at the College of the Bahamas. In January of 2013, she reactivated the first chapter chartered in the region in Liberia, West Africa and honored charter member, President and Nobel Peace Prize winner, The Honorable Ellen Johnson Sirleaf. On November 24, 2013, Alpha Kappa Alpha made history and chartered the first chapter in South Africa covering the cities of Johannesburg, Pretoria and Soweto. Under her leadership, this was the first sorority chapter of any kind established in the country. In March 2014, Evelyn started the first Educational Advancement Foundation Scholarship Fund in the International Region entitled, “The Global Network Scholarship,” for young ladies attending colleges and universities outside of the United States. Currently she serves on the Chapter Basilei Certification committee. Professionally, she is the Executive Director of Government & External Affairs for the School District of Philadelphia, the eighth largest public school district in the country. She oversees all direct initiatives for the Superintendent with internal and external constituents as it relates to achieving success and positive outcomes directly associated to the mission of the District. Evelyn works on short and long-range strategic planning, advocacy, partnerships, government relations, and community engagement programs to support the District’s critical priorities. She builds one-on-one relationships with community, business, and civic leaders to call upon them for collaborative ventures; leveraging long-term and new relationships with elected officials to establish School District champions; and supports the creation and expansion of partnerships with local non-profit and for-profit businesses and institutions to generate financial support for the school district. She builds broad-based networks of support throughout the city and state for the school district. In this role, she serves as a member of the Budget & Finance team managing $3 billion and serves on the Grant Oversight committee for the school district. She testifies before city council and state legislatures to advocate for additional resources for the 155,000 children in the district. Her career spans more than three decades of media and public relations experience and executive leadership in both for-profit and non-profit corporations. Evelyn prides herself on being an advocate for public education spearheading community gatherings, roundtables and town hall meetings in hopes of educating people on the state of public education and the urgency to improve the system to save our children. She has organized thousands of people to rally on the steps of the Pennsylvania state capitol building, led campaigns for equal rights and launched media campaigns to inform stakeholders of the urgent need to help all children receive a fair and equitable education. She is a proud graduate of the American University in Washington, DC where she received her degree in Broadcast Journalism with a minor in Business Administration. She is a devoted member of Enon Tabernacle Baptist Church in Philadelphia, PA., and has been married to her best friend for seventeen years, Dr. Patrick Oates. To this day, her parents remain her role models and her heroes. Her biggest, brightest and proudest accomplishment to date is being the mother of two wonderful children; Andrea-Rose (14) and John-Patrick Oates (10).